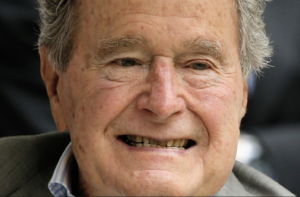 Is it too late for my anti-obituary of George Bush? Loath am I to let him pass into oblivion without a commemoration of his utter ineptitude (he never held any post for more than a year since they were afraid of the damage he would wreak) except at racist malice. Despite mythology, he would not have succeeded in the oil business were it not for investments by his family & their financial connections–& possibly also associations between the CIA & his oil rigs in the Middle East & Caribbean, but that is not proven beyond dispute. The NY Times used to post full transcripts of presidential press conferences & seem to have ceased that practice when his inability to put a coherent sentence together exposed the presidency to ridicule even more than Trump’s tweets. He was known for being obsequious to power & insolent to those he deemed inferior. But what he should be most remembered for is his racism & the wreckage he created in the Black community. As vice-president involved in Contragate & as head of the CIA, he was directly involved in drug trafficking to finance paramilitary terrorist groups, particularly but not only the Contras against the Sandinistas in Nicaragua. The US Congress had cut off funding to the Contras so US officials persuaded drug cartels to contribute millions to the Contras in return for not just turning a blind eye but facilitating drug trafficking into the US. 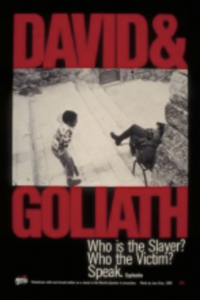 To cover the criminality of this enterprise, Bush scapegoated Black teenagers & vilified them as narcoterrorists which justified police violence & martial law in the Black community. On one occasion, he directed federal agents to induce a 17-year-old Black kid to sell dope in the park across from the White House so they could arrest him & Bush could use that to dramatize the drug problem in a speech. That young kid spent 8 years in jail to make Bush’s so-called war on drugs look good. Thousands of Black & Latino kids went to jail for life without parole for minor drug infractions, as minor as smoking a joint. It is entirely suitable that he stood accused of sexual misconduct in the final years of his life. Let that & his detestable racism stand as his epitaph. If we mourn anyone it is the Black teenagers who continue to die because of the policies this lowlife set in place. Amen. 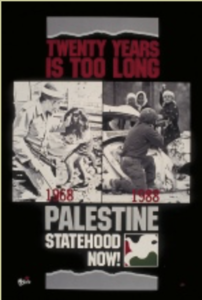 These five posters were designed by renowned Palestinian artist Kamal Boullata who I knew from Palestinian defense work since the 1967 war. 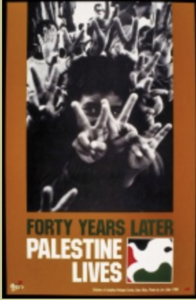 They are included in the Palestine Poster Project & have archival value. 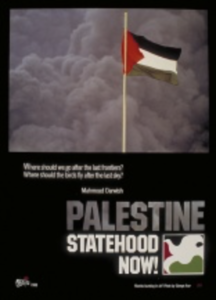 I learned volumes from Kamal about the Palestinian struggle but do not agree with a bantustate solution for Palestinians as he calls for in the posters. It is too massive a discount on justice & self-determination & not a workable solution to leave an aggressive Zionist entity surrounding divided little plantations. Instead I agree with the visionary & majestic proposal of those Palestinians who call for a secular, democratic state where Palestinians & Jews will live as equals & as brothers & sisters. 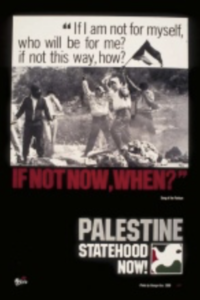 Regardless of my objections, these posters are part of the history of the Palestinian struggle. To raise money for Medical Aid for Palestinians (MAP), I would like to auction them though I have no idea of their monetary value. There is a tiny bit of bird gnawing on three of the poster edges but not enough to destroy their value & it must be said that in some cultures, bird poop is considered a good omen. How much better just a little gnawing? If you are interested in bidding on any of them, please let me know. You can send your contribution to MAP & I will mail the posters to you. They are unable to auction them for political reasons. December 21st was the end of my fourth 30-day suspension in 2018 from Facebook for violating its community standards which are of course entirely arbitrary & driven by objection to my politics. I used the time well by studying the politics of international drug trafficking & other issues which I will be posting about. During my suspension, I lost about 20 friends & nearly 50 readers which is one of the purposes of repeatedly suspending me for nothing. There isn’t much I can do to prevent another arbitrary suspension so I shall proceed as usual writing about the struggles of the oppressed against war, occupation, & genocide. Thank you more than I can say to those who expressed solidarity with me. I’d whimper a little about the frustration of suspension except that Palestinians, Kashmiris, & others get bounced from social media without the possibility of eventual parole. Glad to be back.